After about a year since the announcement of the partnership between Cyanogen and Microsoft, the deep integration of Cortana is finally coming to Cyanogen OS. In an official blog post, Cyanogen announced that it has started to roll out the Cyanogen OS 12.1.1 update which will bring the Cortana app built-in. Cortana is Microsoft’s virtual assistant which is available on Windows phones and PCs. It is like Google Now on Android devices and performs similar tasks. 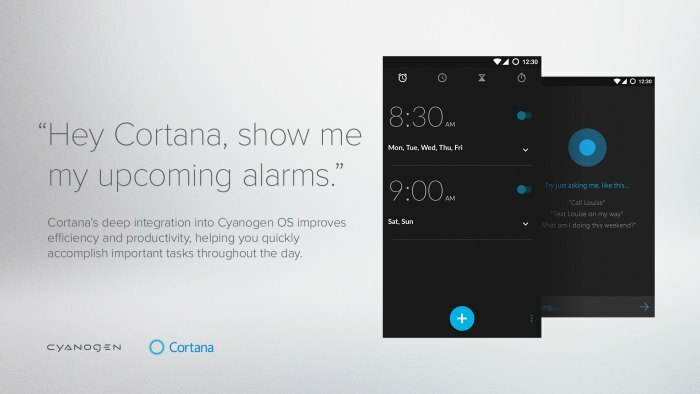 Since Cyanogen update is bringing a deeper integration, users can interact with Cortana by simply saying “Hey Cortana”. As of the now, Cortana is available only for OnePlus One owners in the USA. However, the team has said that it will be expanding it to other regions and devices in future. The users will always have the option to use both Cortana and Google Now, but they can use either Okay Google or Hey Cortana as the hot word for triggering the virtual assistant. Additionally, Cyanogen has said that if any does not like Cortana, then he can always remove the Cortana app by uninstalling it like any other app.